Amazing features for an incredible value. 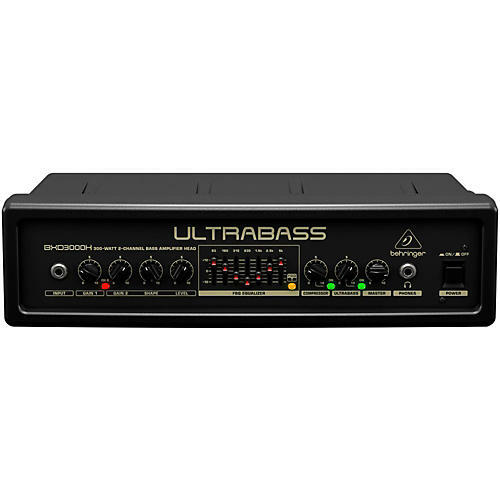 The Behringer Ultrabass BXD3000H is a 300W, 2-channel bass amp head designed specifically for the bass player who requires the ultimate in tonal versatility. Armed with Behringer's proprietary Ultrabass sub-harmonics processor, the BXD3000H cranks out unbelievable low-end, plus the revolutionary Shape filter provides precision sound sculpting to satisfy even the extreme tone connoisseur. Class-D design puts massive output power into a package that weighs in at less than 7.7 lbs. (3.5 kg), giving you all the power of a traditional-technology bass amp, without the backbreaking weight. The BXD3000H is equally at home onstage or in the studio thanks to its built-in XLR DI and Line outputs. There's even an FX Insert so you can access your favorite stompboxes and other external processors. And since modern bass players need a broad range of sounds, Behringer has given the BXD3000H the flexibility to go head-to-head against even the toughest competition, at a price unheard of for this class. Tone. That's what it all comes down to”and the BXD3000H really delivers! Channel 1 provides squeaky-clean operation for the most true-to-life sound of your bass. If you prefer a more aggressive sound, switch to Channel 2, via the front panel button or the supplied dual-function footswitch, and use Gain 2 to dial in the perfect amount of grind. For even more tonal variation, Behringer has provided its proprietary Shape control, which lets you call up a broad range of sounds, anything from mild to wild! And if your gig calls for two basses, say a fretted and a fretless, you can use Channel 2 and the Shape control to fine-tune the sound of a second instrument.